Welcome to Friday, and my weekly chat with Kathy - aka The Brain Lair (@thebrainlair). This week we decided to stick with the science fiction genre and explore a much more recent novel our last one (Fahrenheit 451). For those who are new to the game - there will be SPOILERS. Also, this blog hosts my thoughts (in purple) with Kathy's responses (in blue). Head on over to The Brain Lair to read her thoughts with my responses. Overall, I got pretty invested in the characters pretty quickly. The story is intriguing, and I kept having moments where I thought “I simply MUST know what is going on!” I did feel like the buildup took a long time. I’m halfway into the book now, and I’m just about to really move into the time travel / alternate world aspect of the book. That’s my only real complaint, I think. Perhaps if the book were longer, then it wouldn’t seem like 150 pages was a long time to get into the next chunk of the story. Kathy: I hadn’t noticed that. 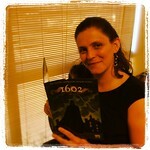 But 1/2 a book is a LONG time to setup a story and if it wasn’t so compelling, I wouldn’t have stuck with it. It seemed more like a different story as opposed to a setup for the time travel aspect. Like I was really getting to know the characters and their motivation so that the time travel wasn’t the story, just a small part of it. I agree. And I have to say as I moved through the story that I found that the difference in style between the more realistic fiction portions and the science fiction portions was a bit jarring. Kathy: Very clever of Hautman. The Martian Biocide reminds me of Ray Bradbury. I think it’s one of the Martian Chronicles stories? When the earthlings go to inhabit Mars but they are bringing disease and devastation? That’s what those words reminded me of. The Digital Plague has to be the time we are living in now! I hope he talks more about that later. I actually mention about people skipping the prologue though here it’s not labeled as such but the writing looks different and chapter 1 doesn’t start till later. They would miss those clues you pointed out. I like the time travel aspect, and how it is handled. I enjoyed how they described how Tucker rescues his uncle. That was set up nicely, with the uncle’s vague memories tying into the actual event as we see it. I love how his father disappeared, and then came waltzing back in with Lahlia. I like how the author just quickly addresses the paradox of time travel (and how the non-corporeal creatures gave up the diskos because corporeal beings could use them and then disturb the flow of time). This seemed like just enough of an introduction to the idea for the age level of the book. Kathy: Yes. When he sees Tucker and feels like he knows him. Of course that could be because Tucker looks like his dad. I wonder how many kids will put that together before Hautman tells them? What age do you think this is? Only Tucker seemed to notice that his dad was different when he returned. Not just in thoughts but in the way he looked, that his skin was different. Why wouldn’t the mom have noticed that? Again, if you hadn’t read the prologue, you would not make the diskos connection. 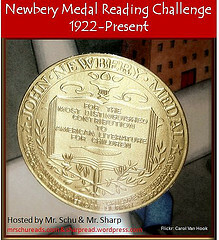 So this is a great book to introduce to a group of students to reinforce the use of a prologue. I know you mentioned that you felt this book paired nicely with Pathfinder (by Orson Scott Card) – as far as introducing and dealing with time travel. The one thing I didn’t like about Pathfinder was how laboriously he explained every little thing. It will be interesting to see how I feel about this in Obsidian Blade once I finish the book. There is a fine line between not enough explanation (I’m looking at you, Dragon Castle, with your lack of any description of how magic worked in your world) and way too much. I love Tucker. He’s adventurous and seems like such a real adolescent. He has a lot on his mind, but he was a bit moody even before his life fell apart. Kathy: Oh My Word. I know many boys like this in middle school. Always coming in with the crazy things they tried over the weekends. I love how he just wants love and attention from his dad and how he misses it since the time travel incident, even the ones that felt forced. Lahlia has also been handled well. I like the mystery she represents. I like how she was sprinkled in through the earlier parts of the book, but I sure hope we get to see more of her. The science fiction I’ve been reading lately tends to skew rather heavily toward male narrators and females being more secondary. I hope her role increases. Kathy: She’s also funny. She seems to be getting stronger and is not afraid to voice her opinion. I loved when she flipped the kid into the water and how she describes what the adopted parents tried to get her to eat. She seems to know much about Tucker so I’m hoping that means they will become some sort of team. Especially since she knows much about the diskos and the Klaatu. 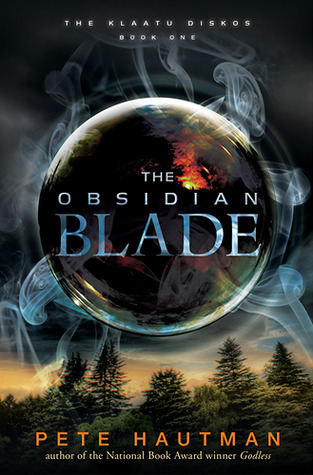 Obsidian Blade seems like more of a mystery than a straight up science fiction novel at this point. Not that I mind the mystery – far from it. I’m furiously typing this up so that I can dive back in and find out how all the pieces interconnect. Kathy: Genre-bending! Yay! That is what’s keeping me reading. I want to know where the parents are! How does this all connect? Can I offer this as part of our study on mysteries? Or will the time travel trip students up? I’d say this is a perfect mystery to offer to students as a choice - and maybe those who are already into science fiction will discover they love mysteries too! I also just finished Across the Universe as part of my SciFi Summer and it had this same infusion of mystery into the tale. How did his father meet Lahlia – and who is she? I know this part is coming up soon. What happened to him in that missing hour that caused him to lose his faith? Kathy: Why did they come back together? And why is this town so accepting of her appearing out of nowhere???!! And, yes, what did Adrian see that caused him to walk away from what was described as a lifetime of study? Who, exactly, is his mother? I’m guessing that she is another person like Lahlia – someone who entered our time stream through the diskos. Kathy: Yes, both orphans. She has seen the “men in black”. Maybe that’s why she is less disturbed about Lahlia’s sudden appearance. Could Lahlia have triggered memories that were so overwhelming they drove Emily crazy???? This is exactly what I started to think as I read about Emily’s slide into insanity. Is Kosh part of the mystery as well, or did Tucker’s rescue of his uncle finish filling in the blanks in that puzzle? Kathy: Emily called Tucker Kosh. Kosh has been through the diskos. Kosh hits it off with Lahlia. Kosh has a profound fear of the diskos (as pointed out by both Tucker and Lahlia). He has to do something. He is the only person that knows where Tucker, Lahlia, Adrian and Emily have gone! Though he doesn’t want to come off as crazy again. He can’t just sit by can he??? There you have it! I need to go back and reread the second half of the book for our chat next week. Be sure to head over to The Brain Lair for more scintillating discussion. Also, if science fiction is your thing (or you want it to be!) check out my SciFiSummer tag here at the Melange for some great suggestions to add to your reading pile or my Why Sci Fi tag to learn a bit about why I think science fiction is a valuable genre for inclusion in our classrooms.